Summary: Louna, daughter of famed wedding planner Natalie Barrett, has seen every sort of wedding: on the beach, at historic mansions, in fancy hotels and clubs. Perhaps that's why she's cynical about happily-ever-after endings, especially since her own first love ended tragically. When Louna meets charming, happy-go-lucky serial dater Ambrose, she holds him at arm's length. But Ambrose isn't about to be discouraged, now that he's met the one girl he really wants. I've been a huge fan of Sarah Dessen for as long as I can remember, and if you're a pretty active follower of this blog, you'd know that I recently wrote a letter to Sarah thanking her for all of the amazing stories she's shared throughout the years, because there's been a lot of speculation about this being her last book. So, needless to say, the idea of me having finished my last Sarah Dessen book ever totally breaks my heart, but it was a good book that made me feel all the feels in all the right ways, so as far as (potential) final books go, I was pretty satisfied with this one. As the summary explains, Louna is a teenager who is about to head off to college, and she's spending her final summer working with her mother and her family friend in their wedding planning business, which is constantly busy and giving her tasks to do because it's so popular and successful. Through a long string of events that I'll leave it up to you to read, Louna ends up meeting Ambrose, who is basically the cockiest, most arrogant, full of himself guy around. So, needless to say, they don't get along at first. At all. In fact, Louna finds him practically insufferable. And then she ends up having to spend her summer working with him. So yeah, you can only imagine how well that goes, and all of the little roadblocks that pop up in between. So this book is basically navigating the rocky relationship between Louna and Ambrose while also delving into Louna's troubling and heartbreaking past, which is part of the reason that she's so reserved and closed-off in the present day. What exactly is making Louna so hesitant to get close to anybody again? Well, you're just going to have to read it and find out. Once again, Sarah Dessen wrote a super great book that made me cry, laugh, swoon, and even gasp at all of the right times. I really liked Louna's character, and Jilly's too, for the brief moments we saw her. Their relationship dynamic as best friends was something to be envied, with how close they were to each other and how much they loved each other. I also really liked William, who I thought was a perfect and hilarious father figure sort of character, and you could tell how much he really cared for Louna and her mom, which made him appeal to me even more. And as for Louna herself, I really liked getting to be in her head and even though it took a little while for us to figure out what exactly happened with Ethan, all of the puzzle pieces eventually fall into place, and when they do...oh man. That's all I'm going to say on that. Oh man. I remember audibly gasping when I finally learned the whole story, and my heart just felt so...wow. Like I've said a million times before, I've been a fan of Sarah Dessen's books literally for as long as I can remember. They were a part of my childhood, my awkward phase, and they're even a part of my life now as I'm in college and making my own way in the world. If this really was her last book, I feel that she definitely left things on a good note, because this book really warmed my heart and reminded me why I loved her stories so much in the first place while I was growing up. (Spoilers ahead, so please skip to the next paragraph if you don't want the story ruined for you!) The ending of the story was definitely the part where I was the most emotionally invested. That whole scene with Louna thinking it was Ambrose and her world starting to fall apart again...I was actually gasping out loud at times and felt my pulse rate go up just at the thought of something so terrible happening to Louna again. But when it didn't, and they had that epic kiss...you guys. I was swooning. Even though I wasn't a fan of Ambrose at first and I thought he was cocky and full of himself and basically every synonym I can think of for the world "terrible," I was really rooting for the two of them in the end. So it made me happy, that's for sure. Even though I was really opposed to him for about 75% of the book. There really wasn't anything in this book that I disliked. There were some parts where I felt that Louna's character could've been explored a little deeper, because other than the tragedies in her life and her relationship with her friends and her family, we don't know much else about her. So that's the only thing I didn't enjoy about the book structure-wise. The only other thing I can think of not liking was Ambrose, but that has nothing to do with the writing and was totally the point of the book. He was basically the cockiest character I've ever met, and I've read a lot of books. It definitely took me a decent chunk of time to warm up to him. But overall, I really, really liked Once and For All. 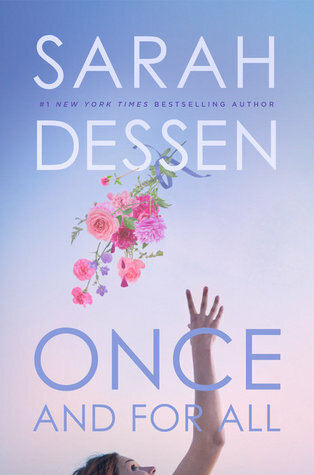 Sarah Dessen's romance books just have a way of being so much deeper and more important than your basic fluff pieces, intertwining important (and yes, sometimes even heartbreaking) backstories to keep you on your toes from the beginning until the end. Longtime Dessen fans will also notice several literal references in the book that allude to previous stories, such as Colby, the beach town that seems to make an appearance in basically every one of her books, especially The Moon & More. The entire book is just a feel-good summer romance that may have its moments of seriousness, but overall, it's an adorable (and hilarious) love story. And if you're like me and you're a total sucker for a good wedding (and you've been planning your own since you learned how to walk), I'd also definitely recommend this book to you. When I finished it, it basically made me want to go and plan a party. I just really, really liked the entire thing. If this really is Sarah's last book, I'll be devastated (of course) because she's been a staple of my life for so long and I absolutely love all of her stories, but I'll still smile and be satisfied with her going out on a good note. I really loved Once and For All, and if you're a fan of romance, I definitely think that you will, too.